A spot for me to share my obsession with zentangles. Please contact me at TinkerTangles @ gmail.com should you have any questions or comments. Thanks for stopping by! Sunday was Earth Day and I must confess that I was unable to celebrate it in an Earth friendly way. We spent the day driving home from a wedding in Virginia. 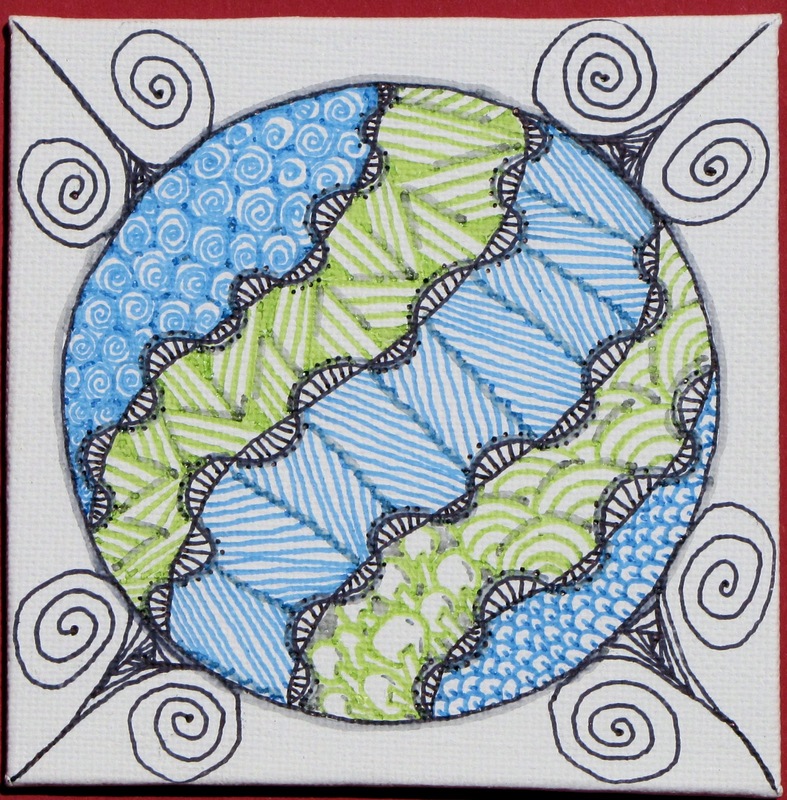 It pleased me though to see that the challenge this week was to create a tile that celebrates our home planet. I wasn't sure what I was going to create when I read the challenge, but I knew that I was going to use blue and green ink to draw. Really, a challenge inspired by Earth just called for color to me. When I sat down to start my first tile, I decided that I wanted to draw the Earth in space. I contemplated tracing out a map or image of the Earth but then decided that I would just go for a suggestion of Earth rather than a literal translation. Because I started while sitting in the waiting room at the orthodontist my circle is a bit wonky but no matter. I added a few shapes to represent land and I was off. I made my blue section first and then went and added my green. I think that I should have stopped and not added the black, however. I think that I liked the tile better before. I added the "stars" with the Sakura glitter pen to break up the darkness. Plus, if we were looking at Earth from space we'd see stars too. After finishing my first tile, I wanted to do another one. Since I found some 4" canvases at Michaels, I've been a bit obsessed with them. 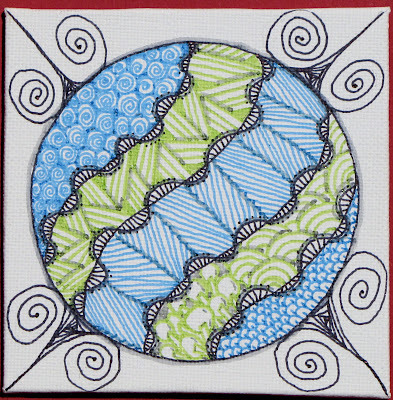 This second Earth is done on a 4" canvas "tile". I say tile as it is solid all the way through. It is some hard material (cardboard maybe) covered in canvas. The tile is thin and pretty easy to work with. I will be doing a post on the canvas and pens that I use next so check back if you'd like to see more. 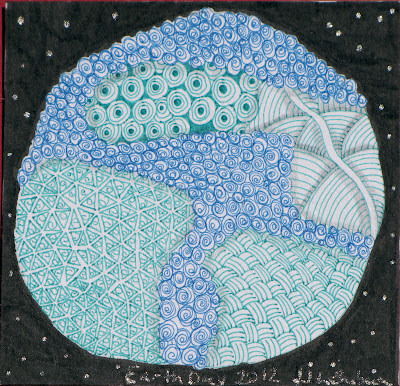 I decided that I wanted this one to be more of a suggestion of Earth. I started with a circle and then added Organza to divide the circle. For this tile I used Bic Mark-It pens with the ultra fine tip. The green that I have is very light and I ended up going over my lines several times to get them as dark as they are. I am still working out the shading on the canvas though. In some places, I think that the grey pen is successful but in others not so much. I find that the Bic pen kind of "puddles" at the tip so that a spot of extra ink can be left when you pick your pen up. You can see this best in the green sections. I find though, that it I end my gray lines on a black one, that the dot blends into the black and is no longer an issue. I like this tile and think that I will use the divided circle again. I really like how it looks. Thanks to Laura for another great challenge. I hope that your foot is doing much better. Blues and greens of beauty round and round they go and they inspire joy!